There’s plenty to complain about in our solar world, but I’d like right now to take a few paragraphs to say what I’m personally thankful for in our solar industry. First, I’m thankful for every individual, business, and organization that’s gone solar this year and in years past. As much as the solar industry has grown, these people are still the early adopters, and I’m grateful that they’ve had the courage to lead the globe in producing clean energy via solar power. Speaking of leadership, I’m also grateful and thankful for the solar advocacy organizations that work throughout the year to promote and protect our solar industry. We may not always agree with what they do or how they do it, but they’re doing something positive on behalf of me, the solar industry, and consumers. So, thank you SEIA, SEPA, The Solar Foundation, Vote Solar, IREC, ASES, 350, NextGen Climate, Oil Change International, TASC, and TUSK off the top of my head. If you’d like to thanks and recognize any other organizations, please do so in the comments section below. I’d also like to thank our local and national politicians, utility executives, and public utility commissioners who have supported those early adopters who have gone solar and still want to go solar. Yes, I could gripe about the ones who have opposed solar and made it more difficult for consumers, but I personally think our solar glass is more full than we know. There’s a reason we have over 90% solar support in the U.S., and I’m sure that the majority of our politicians and utility commissioners will also see the solar light eventually… if they don’t already. Hold onto your hats. I’m now going to be publicly grateful for and thankful for President Obama, his energy-related cabinet, and his clean energy advisors. I know that’s going to be controversial with many of my close solar friends who feel that the President has not done enough for solar, but once again, I ‘m seeing him in a brighter solar light. Under his administration, we’ve had more solar installed than in all the presidents before him, combined. Plus, though it took him a few years, he did finally put solar PV on the White House roof—a first and a great symbol…even if he’s not promoting it enough. But it is there, so thanks. Could Mr. Obama have done more for solar? Certainly, but come on. Just imagine what our solar thanksgiving table might have looked like with an EPA under McCain-Palin or Romney-Ryan administrations. We’d be much farther behind than we are today, so thanks Barak. Let’s see what you can pull out of your presidential hat in the next 2 years. This may be self-serving, but I also have to acknowledge our industry’s solar marketing, journalists, and customer service teams, especially if you’re a team of one. We can have the best solar technology in the galaxy, but if nobody is writing, blogging, Tweeting, FBing, visualizing, Ad-buying, PR-ing about it, who would know? Know that I recognize your value and that I appreciate your tireless efforts to stand out and educate people about the benefits of solar installation and solar products. Oh, and you solar sales people, a turkey with all the trimmings to you, too. We marketers may get the message out, but you rock for closing the deal. And installers, I haven’t forgotten about you. At my Thanksgiving table, I raise my glass of Guinness Stout to you. My solar marketing friends and I could shout about solar 24/7, and the sales people could close a million deals, but solar doesn’t actually happen without you all getting on roofs and putting pole mounts in the ground. Thank you. The world is literally a better place with every solar kilowatt-hour that you interconnected to the grid. A toast. And where would the solar industry be without solar finance analysts and CFO’s? I’ve met many of you, and sometimes I quietly squirm at how cold and clinical you can be when squeezing every cent and euro out of a solar Watt. Still… I have to admit that it’s money, credit, and financial innovations that are primarily driving our modern solar boom. So, keep doing what you’re doing, but please remember that solar industry workers aren’t just numbers. I’m also grateful for our solar entrepreneurs and engineers. I wanted to become one of your tribe when I was in high school…and then I took calculus. Years later, I realized that the solar industry needed marketers as much as engineers, and so I found my place in the solar world, but it’s you people who are designing, hacking, and engineering the solar present and future. Thank you for sticking with solar instead of …ya know… developing SnapChat or engineering a new armpit-hair trimmer. 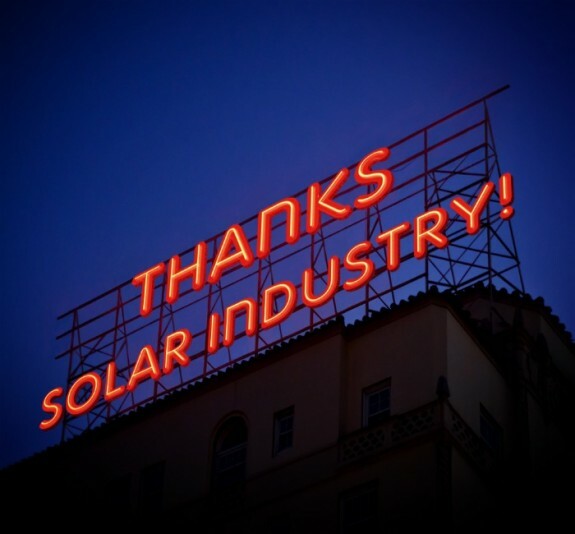 I’m sure I’ve missed some solar industry players, so please forgive me. If you’re still reading this, know that I’m grateful for you for just doing that. We all have solar work to do, and I sincerely appreciate you taking a few minutes to read my solar marketing thoughts every week, or perhaps just this once. Happy Thanksgiving, solar industry people! Take a well-deserved break, and then come on back and… UnThink Solar.